The most important aspect of tree removal remains, as always, safety. Ada Tree Service is committed to performing all aspects of tree work in the safest way possible. At our weekly company-wide safety meetings, our crews are trained in new techniques and refreshed on established methods. 1. What is the safest way to remove the tree? 2. What equipment is needed to remove the tree safely? 3. What opportunities for recycling are available? 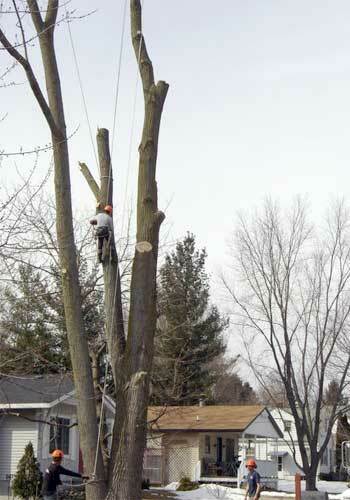 Safe tree removal requires both the experience to determine the best options as well as access to the necessary equipment. With our extensive fleet of cranes and other heavy equipment, we can often remove a tree mechanically, which can make the tree removal process both safer and quicker. In some cases, a tree is only accessible by foot, in which case our skilled climbers and ground crew work together with a system of ropes to safely lower the tree in sections.